TOWERING WITH THE SAME GRACE AS THE CEDAR AND FIR TREES that surround it, the house dubbed “intricate” is a gem in the jewel box of Edgewood Log Structure’s rosters of homes. 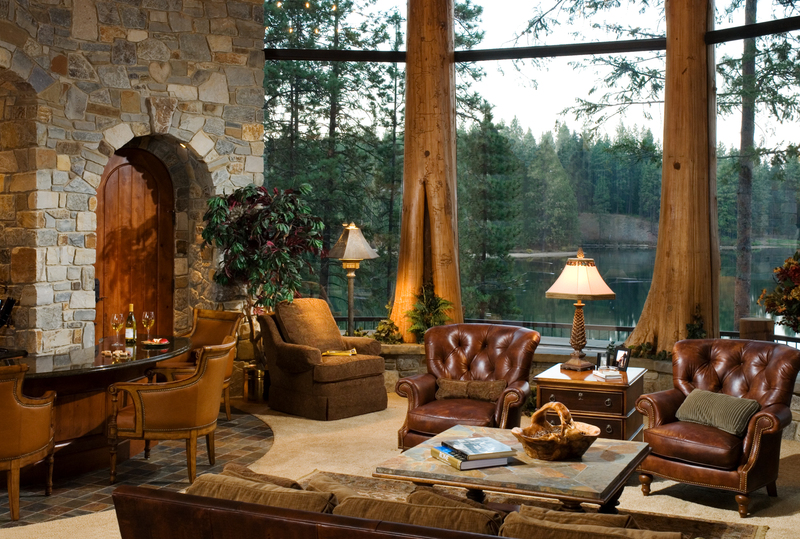 The graceful residence curves around a cove along the Spokane River in Coeur d’Alene, Idaho. Incorporating log and timber into the contemporary home, Brian Schafer, president and lead designer of Edgewood, fused the surrounding environment with the residence. With a nod to historic national park architecture the complicated rooflines differentiate the home from the forest, while simultaneously honoring its beauty. The combination of natural materials resulted in a stately hybrid of log, timber and stone. Working with the philosophy “Perfect will have to do,” Schafer expects excellence from every Edgewood project. He was taught the timberframe and construction trade from a master builder who would accept nothing less than perfection, and he has passed on that ethic in his own company for 26 years. 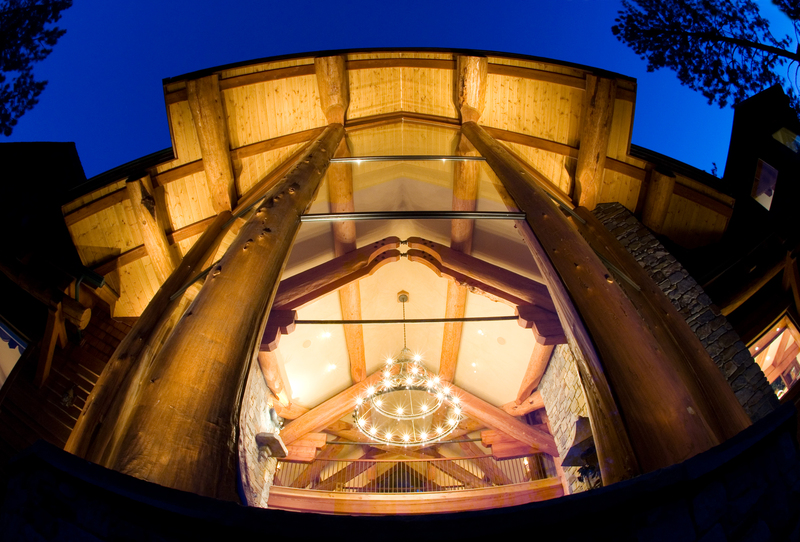 Best known for the trademarked element, Glass Forest®, a fantastic fusion of glass and cedar, Edgewood has built custom homes both domestically and internationally, but because of the characteristic materials — log and timber — most of the company’s projects are located in the Rocky Mountain West. It was the Glass Forest feature that attracted Intricate’s owners, Don and Chris** to Edgewood. Interested in incorporating the glass element into a new Coeur d’Alene home, they approached Schafer with definitive needs, but total trust in his architectural design experience. Family was the focus for this project. When they built the home, they wanted to have plenty of space for their teenage daughters to feel comfortable and to enjoy the outdoor setting, as well as room for large family gatherings. Chris loves to cook, so naturally, the home was centered on the kitchen. Speaking reverently about her home, Chris is willing to admit that the house is much more than a kitchen sink. It’s been a uniting force for her family and close friends. Featuring three bedrooms, eight baths, an elevator and a theatre room within just over 6,500 square feet, the home is filled with impeccable detail and personal style. First impressions come before a guest steps inside, beginning with the sheltering welcome of an elaborate port cochiere. 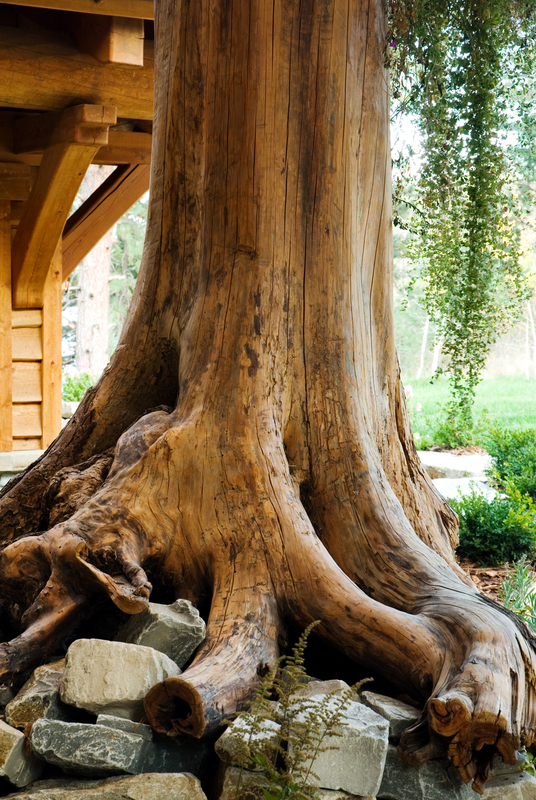 Made from four massive Western larch columns with the bark and roots still on the tree, the connection to nature is stated clearly. Schafer found the logs from a source in the Yaak Valley of northern Montana, after the ancient, 36-inch diameter giants were felled in a 100-mile per hour windstorm. The effect of this entry point makes the house appear as if it was grown from the trees. 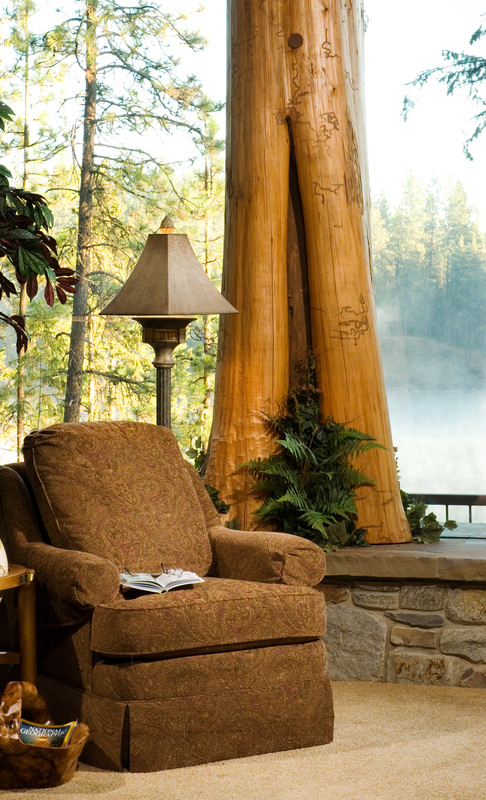 Next, a step through the front door reveals a serene view of the river across the great room. An instant sense of calm is filtered through the tremendous panel of the Glass Forest® feature. This is Edgewood’s largest Glass Forest installation so far. The owners worked with interior designer Stephanie Beaudrie of Coeur d’Alene to select the warm palette of colors and textures that make up the cozy spaces inside. 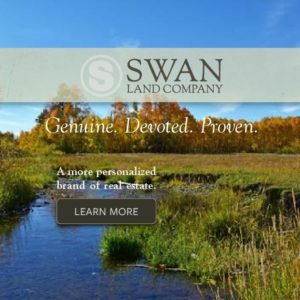 While Edgewood offers design-build services, for the Intricate project, Schafer worked with Edwards Smith Construction, a custom homebuilder based in Idaho and owned by Jim Edwards and Andy Smith. The Edwards Smith crew worked to blend structural log and timber elements in unique form. In the truss work alone, handcrafted logs turn into timberframe members before becoming log again for a show of unparalleled craftsmanship. Even a massive rock formation in the early stages of excavating the building site did not stop progress on the home. Rather than blasting the stone, Schafer and Edwards, worked together to find a creative solution and instead built around the rock. In the end it became a notable feature in the ground floor of the owners’ wine room, replete with a natural water feature. With Intricate, Schafer came as close to perfect as he ever has in Edgewood’s tenure. 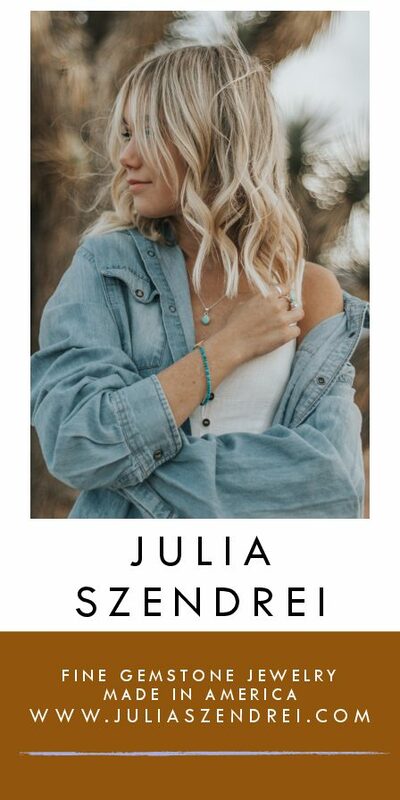 The owners were one of the top three clients I’ve ever worked with, in that they were gracious, supportive and allowed me to work creatively and freely,” Schafer admitted. In this case, yes, perfect will have to do. Framing the Spokane River, Edgewood’s Glass Forest® feature inspired the owners to build their dream home in Coeur d’Alene, Idaho. Edwards Smith Construction implemented Brian Schafer’s design of soaring timbers and glass throughout this family home. 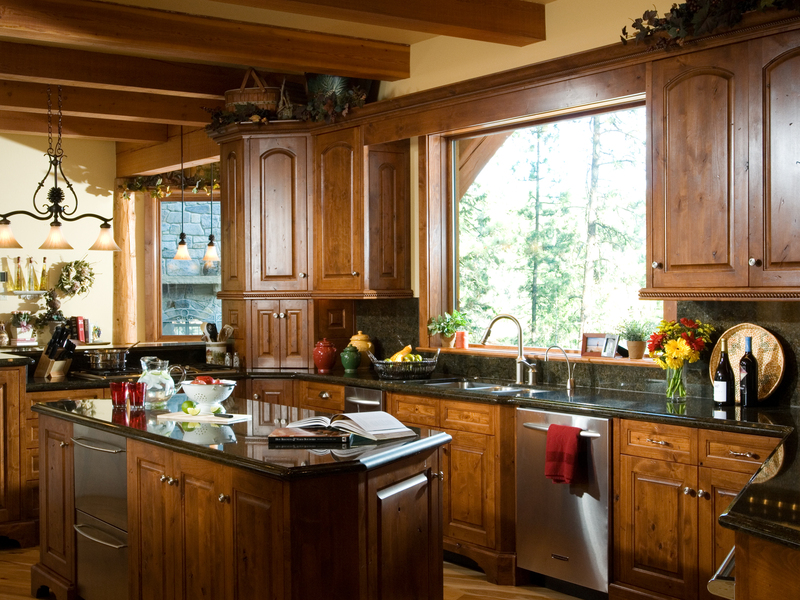 The kitchen overlooks the river and is truly the heart of the home. Working with interior designer, Stephanie Beaudrie in Idaho to cultivate a cozy great room that is as connected to the comforts inside as to the vista outside the window. 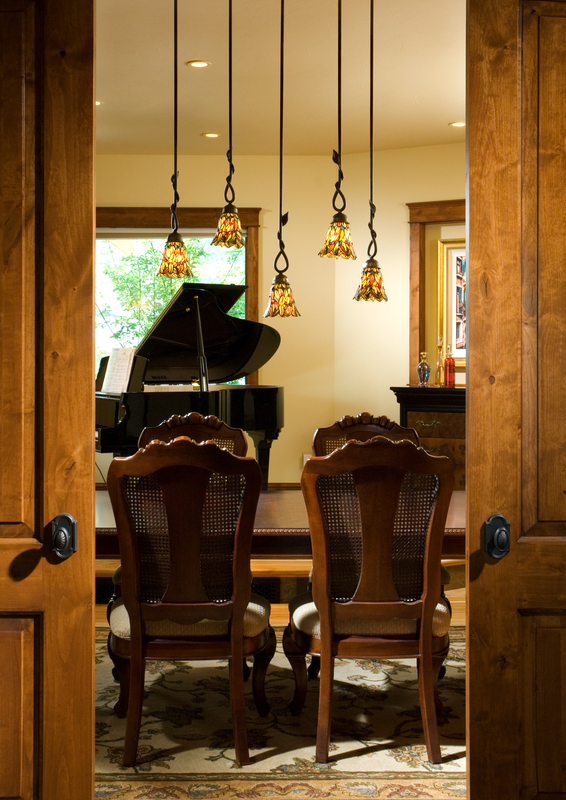 Artisan-made pendant lighting accents the formal dining room. 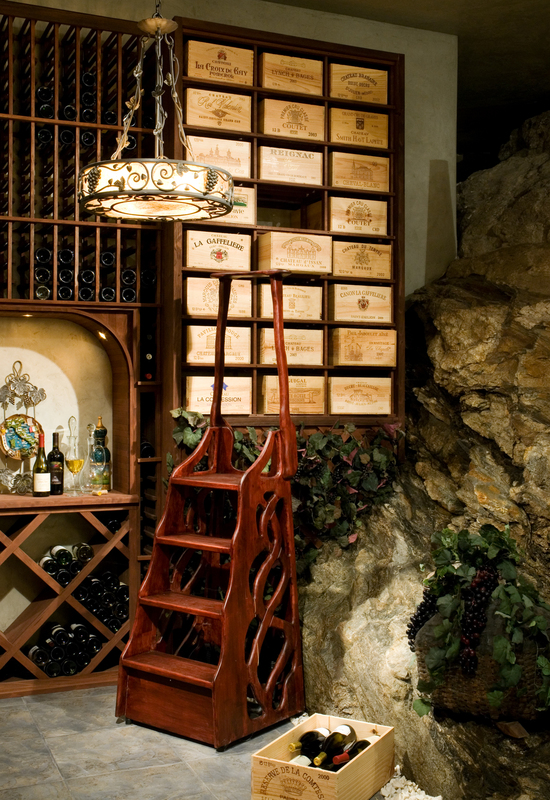 Incorporating the massive stone into the foundation of the home’s ground level resulted in a unique natural rock feature in the wine cellar. 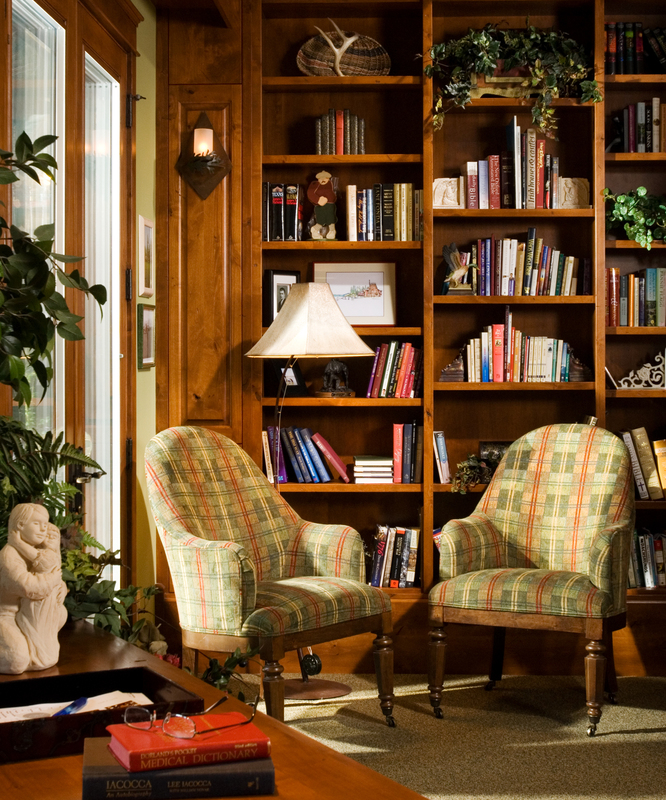 Edwards Smith Construction custom-built floor to ceiling bookshelves in the library, adding to the overall coziness of Intricate.